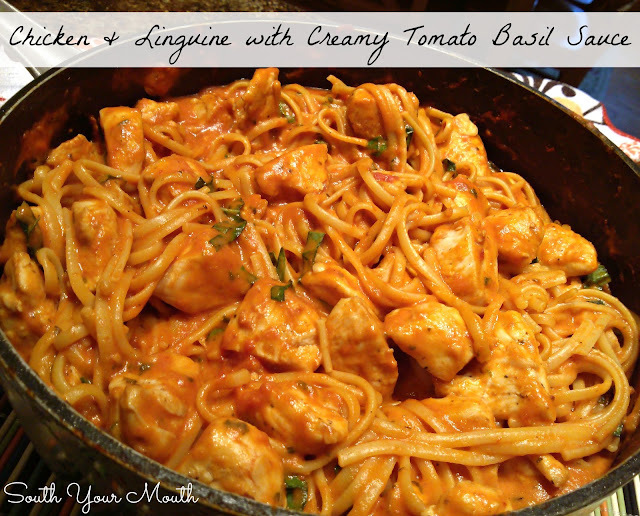 Linguine with chicken cook together in one pan in a creamy tomato sauce with fresh basil. Do not let this recipe fool you. At a glance, it looks complicated but it’s not! This is just an easy-peasy one-pot pasta dish masquerading as a fancy-pants eye-talian specialty! I love that the pasta cooks in the sauce. I mean, Holy Layers of Flavor, Batman! Then there’s the cream that makes it extra rich and luxurious. And the fresh flavor from the basil there at the end? Stop it! Add chicken, olive oil, 3/4 teaspoon salt, pepper and garlic to a medium bowl and toss to coat chicken evenly with oil and seasonings. Heat a 12-14” skillet over medium-high heat. Add half of chicken to skillet and brown on all sides (do not worry if chicken is cooked through, it will continue cooking in sauce later). Remove chicken from skillet and set aside. Cook the remaining chicken pieces the same way and also set aside. Cook the chicken in two batches to ensure it browns nicely. If you crowd the pan, the chicken will boil, not brown. 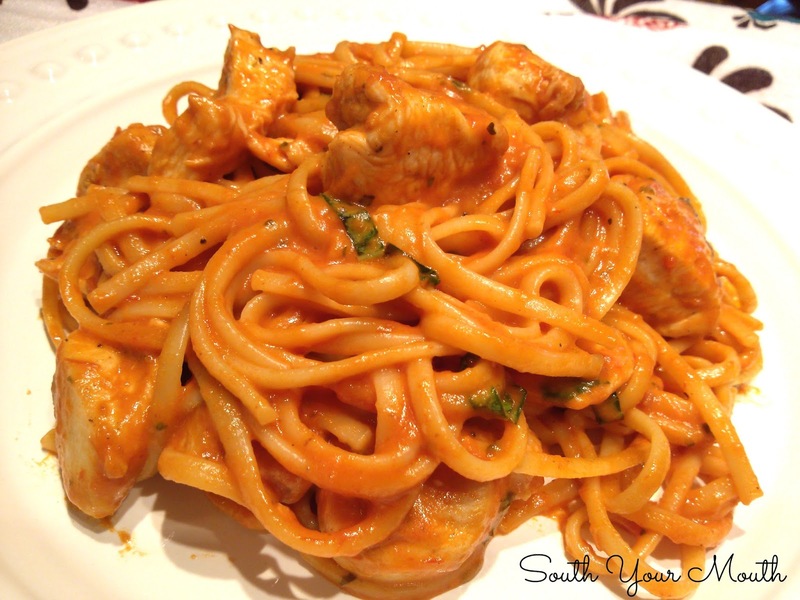 Once you’ve removed the chicken from the skillet, add spaghetti sauce, water, remaining 3/4 teaspoon of salt and uncooked pasta to the skillet. I usually break my linguine in half so that it’s easier to fit in the skillet and stir but you don’t have to. Bring skillet to a boil, stirring continuously to ensure the pasta doesn’t clump together. Reduce heat to medium-low, cover and cook* for 12-14 minutes, or until pasta is al dente; stirring occasionally. Add chicken, cream and basil, increase temperature to medium and bring skillet to a simmer. Simmer, uncovered, for 5-7 minutes or until sauce has started to thicken. Remove from heat and serve. *You may have to add a few tablespoons of water to your skillet if the pasta soaks up all of the sauce. Variances in spaghetti sauces yield variances in this step of the recipe. Which type/brand of spaghetti sauce do you prefer? I really like the traditional Prego sauces.